Place the chicken parts in the slow-cooker crock. If there is too much chicken to put in a single layer, put the thighs on the bottom and the breasts on top. Sprinkle the onion evenly over the chicken. Pour enough sauce over the chicken and onions to just cover it, using a spatula to spread it completely over the chicken. Then, put the cover on the slow cooker and set it to LOW. The chicken will take about 5 hours to cook. After 5 to 6 hours, check to see if the chicken is done. It should break apart easily when you pierce it with a knife or a fork. When the chicken is done, it's time to "pull" it. Remove the chicken pieces from the slow cooker, leaving the cooker on LOW. Let the chicken cool for 5 to 10 minutes on a sheet pan or in a shallow baking pan. Then, with two forks, a knife, or your clean fingers, shred the chicken into small pieces. The chicken should pull apart easily from its long, slow simmer in the slow cooker. Discard any bones. Return the shredded chicken to the slow cooker and use a wooden spoon or a pair of tongs to toss it with the sauce, until the chicken is completely distributed. If the chicken seems dry, add more sauce. The chicken can remain in the slow cooker on LOW or the KEEP WARM setting until you're ready to serve it. 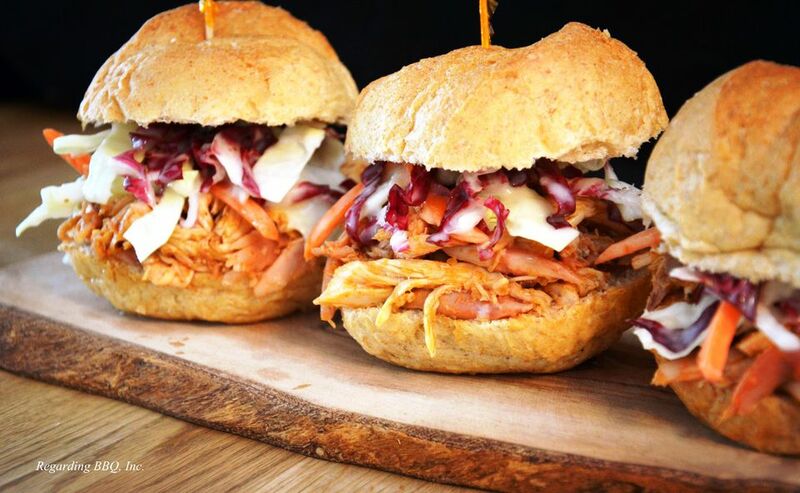 You can serve the pulled chicken on its own, or on a sandwich bun with some crisp cole slaw.